Riolo Terme: Spa and Nature in the Outstanding Setting of the 'Vena del Gesso Romagnola' (Chalk Vein). 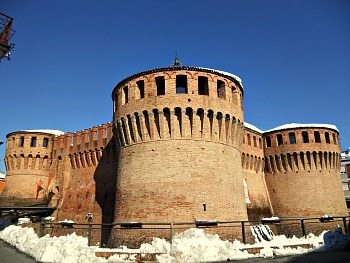 Riolo Terme is a town particularly renowned for its castle (Rocca; pictured above) – which today hosts an interesting museum – and the spa. During the Middle ages the main centre in the mid-Senio valley was the castle of Laderchio, from which depended a network of surrounding fortifications and towers. Between 1494 and 1499, Caterina Sforza (whose name is strictly interconnected with that of nearby Dozza and its castle) also initiated the construction of the castle in Riolo, as well as that of the defensive walls that still surround the town today. The Rocca in Riolo grew in importance while the castle of Laderchio progressively decayed; in this way, Riolo became the main centre in the area. At first it was called ‘Riolo dei Bagni’ ('bath') for the importance of its waters, then it changed its name into the more modern version of Riolo Terme, for the presence of the spas. The castle is to this day a very well-preserved building, and (as anticipated above) it hosts the Museo del Paesaggio dell'Appennino Faentino, dedicated to the local landscape, while the spa waters used in Riolo still constitute the town’s main asset; they are solphorous-chalky in nature, as they percolate through the ‘Vena del Gesso’ – the gypsum ridge extended between the Senio and Santerno valleys. The origin of the ‘Vena del Gesso’ (‘Chalk Vein’) outcrop dates from the Miocene, and this feature develops in a landscape dominated by a succession of spectacular high cliffs, like the Riva San Biagio and Monte Mauro (read description of the itineraries below). The 'vein' is formed by a soluble mineral and presents important karstic phenomena – such as a vast system of caves, sink-holes, dolines and resurgent springs (known as ‘risorgive’ in Italian). The vegetal landscape (flora) is that typical of hot and arid habitats in the south-facing slopes, where over the rocks grow sparse specialized plants, amongst which is the rare Persian Fern (Cheilanthes persica), which finds its only Italian station here. Wherever there is a bit more soil, a Sub-Mediterranean garrigue formation becomes established – with Elichrisum, Absinthium, Lavender, thickets of Pubescent oak and Holm oak, Terebinth (or Turpentine) tree (Pistacia terebinthus) and Italian Buckthorn (Rhamnus alaternus). On the slopes facing towards the north the climate is fresher and more humid, with woodlands dominated by Hop Hornbeam (Carpinus betulus) and Manna ash (Fraxinus ornus), sometimes substituted by chestnut trees; in the more secluded locations – such as gorges – live montane species like Snowdrop (Galanthus nivalis) and Bladdernut (Staphylea pinnata), while by the caves one can admire the elegant Hart's-tongue Fern (Phyllitis scolopendrium). As for the fauna, among the mammals one certainly has to mention the bats, which have important colonies here – especially in the caves – with species such as Greater Horseshoe Bat (Rhinolophus ferrum-equinum); Mouse-eared Bat (Myotis myotis), Lesser mouse-eared Bat (Myotis blythii) and Southern Bent-wing Bat (Miniopterus schreibersii). There are also several species of day-time and night-time birds of prey; some of them nest here, amongst which is European Honey-buzzard (Pernis apivorus), Montagu's Harrier (Circus pygargus), Peregrine Falcon (Falco peregrinus) and Eurasian Eagle-owl (Bubo bubo); noticeable is also the presence of Blue Rock Thrush (Monticola solitarius) and Eurasian Crag Martin (Ptyonoprogne rupestris). The most interesting species of reptile is the typically Medieterranean Riccioli’s Adder (Coronella girondica), completely harmless; amongst the amphibians are Italian Cave Salamander (Speleomantes italicus), Fire Salamander (Salamandra salamandra), Yellow-bellied Toad (Bombina variegata) and, amongst the fish, South European Nase (Chondrostoma genei) and Padanian goby (Padogobius bonelli; ‘ghiozzo padano’ in Italian). The link between man and the ‘Vena del Gesso’ is ancient and varied. In Prehistoric times, caves such as the Tanaccia and Re Tiberio were being used as shelter and a place of worship of the Water Goddess, whose roar could be heard in the depths. 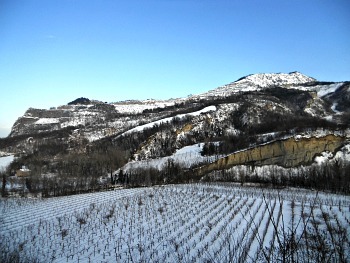 During the Middle Ages, on the 'Vena del Gesso’ arose religious and military settlements, such as Brisighella, Rontana, Monte Mauro, Sassatello and Rocchetta, Tossignano and Gesso (in the picture above, the 'vein' near Borgo Rivola; notice also the low vineyards below, once traditionally supported by trees). In order to build these settlements, large blocks of chalk were being used, as well as for the farmsteads and the smaller hamlets of Crivellari, Borgo Rivola, Gesso and the buildings in the historic centre of Brisighella and Borgo Tossignano. More ancient and widespread is the use of ‘cooked chalk’, as it is being witnessed by local chronicles dating to the beginning of the 16th century. For more than five centuries, the so-called ‘gessaroli’ have worked in the quarries of Tossignano, Brisighella and Borgo Rivola. 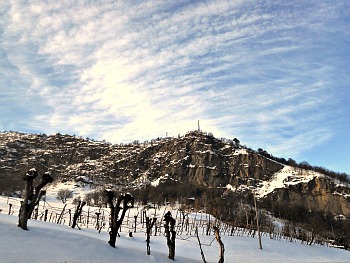 In the area of the ‘Vena del Gesso’ have also lived generations of farmers, taking advantage of the woodland and chestnut trees while tilling the land above the cliffs, thus creating a varied human landscape, pleasantly ‘drawn’ with an alternation of woodland patches, small plantations, vineyards, orchards and olive groves: all favoured by the local micro-climate of the ‘Chalk Vein’, which protects from the cold northerly winds – as it was well understood by the monks who ten centuries ago first started the cultivation of olive trees, coupled with chestnut trees on the north-facing slopes (as it can be seen, for instance, In the historic chestnut grove at Campiuno). The agriculture here gives out products of outstanding quality; these are being valued through specialized productions and certified marks (the so-called 'marchi di qualità'). Among the others, stand out the peaches of Romagna, the scalogno of Romagna (a type of onion), the extra-virgin olive oil produced in Brisighella, the chestnuts of Castel del Rio, the apricots of the Val Santerno, the aromatic herbs and the ‘forgotten fruits’ of the Herb Garden in Casola Valsenio and – perhaps above all – the so-called ‘carciofo moretto’ (a particular type of artichoke). In the whole area are found truffles, fresh and seasoned cheeses, and cured meats – especially those coming from the ‘Mora Romagnola’, an autochthonous breed of pig. Also, the typical dishes of this part of Romagna can be coupled with the local outstanding wines; above all, among the whites, the Albana and Trebbiano di Romagna, and – among the reds – the Sangiovese di Romagna; more recently, also the ‘Colli d’Imola’ and ‘Colli di Faenza’ have been added to the list (as for the sweet wines, there is the famous Cagnina, which is traditionally enjoyed with cakes and/or dry sweets). 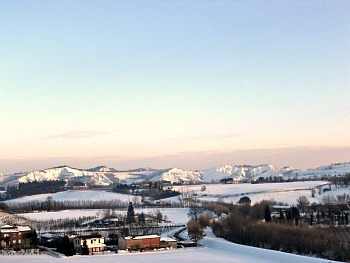 The valleys of the Senio, Santerno, Sintria and Lamone, which run across the Apennines on the western side of Romagna, are cut at about ten kilometers of distance from the joining line with the plains by the 'Vena del Gesso' (see a winter image of it above: to the right is the highest summit of Monte Mauro; to the left, the typical 'eaten' shapes of former quarries near Borgo Rivola). The 'vein' is a calcium sulfate ridge that, variously crystallized and stratified in massive banks, emerges for a length of about twenty km, with a width that is never more than one km tihck, and straddles the territories of the muncipalities of Casalfiumanese, Borgo Tossignano and Fontanelice in the province of Bologna and Casola Valsenio, Brisighella and Riolo Terme in that of Ravenna. The formation – so-called "chalky-solhporous" (‘gessoso-solfifera’) for its imposing aspect and composition, as well as for the extraordinary variety of its morphology and the typical aspect of its flora and fauna – has had a strong influence on the construction of the surrounding landscape, favourably affecting the micro-climate of the four above-mentioned valleys, and leaving a mark also in the history and life of men. The 'vena' displays a natural and historic richness that surprises and fascinates at once whoever is walking the trails of the park, starting from those that cross the ridge – from which one can gather the lush green and shadiness of the north-facing slopes or the contrasting, light aridity of the chalk banks of the south-facing slopes, whose minerals, while reflecting a pale moon-like shine, have been aptly termed ‘moon rock’ (‘selenite’). Along the trails that zigzag across the reserve – and that offer atmospheric sights at each turn of the way, as well as the chance to observe from close-by the effects of crystallization on the chalk mineral – one can also observe the karstic features generated by chalk; that is, dolines, sink-holes and caves still bearing the sign of human presence since ancient times, besides the deep cavities that open up and the peculiar flora that they support. Occasionally – and with a bit of luck – it is also possible to admire the escape of a wild animal: all this without ever forgetting the traces left by man and its labour, such as dwellings, rests of old religious or military settlements or ancient chalk quarries – by far the most characterizing presence in the area. But the most thrilling excursion is without a doubt the one along the main ridge: a route that fills the eyes and touches the soul with the extraordinary richness of the ‘Vena del Gesso’ chalk formations, as the views open up towards the highest mountains of the Apennines on one side and over the plains on the other: if towards the south the blue-green ridge fades away on the hazy line of a distant horizon, looking towards the north is a totally different experience, as one catches sight of the arid cobweb of the ‘calanchi’ (seen below in their winter 'dress', in a picture taken from the Rocca in Riolo Terme), beyond which are the vast plains of the Po valley, glowing with white towns and cities and only limited at the end by the Adriatic sea, which from here – to say it with the words of local poet and screenwriter Tonino Guerra – looks like a “long and blue line” (“una riga lunga e blu”). The Itinerary from Cà Carné (No. 1). This itinerary starts at Cà Carné, which is the main visitor centre for the eastern sector of the park and provides the typical services of a mountain hut (such as food and accommodation). Before starting the excursion, it is worth visiting the small but interesting naturalistic museum hosted inside, which is dedicated to the fauna of the ‘Vena del Gesso’, then one ascends to the left of Monte di Rontana (CAI-marked path 505). Once reached the ridge at Cà Angognano, keep on until a country lane (second on the right), which you will need to follow in order to go around the hump of Monte Spugi (439 m), on CAI-marked path No. 511/b, until reaching the small oratory at Vespignano, amongst orchards and vineyards, where one takes CAI-marked path No. 511. Another country lane then takes to the area of Castelnuovo, thus coming back on the chalks, whose rugged flanks are covered in sparse woodland. This latter country lane leads to a road going downhill, until one turns to the right into the woodland (always following CAI-marked path No. 511), and then ascends again towards the ridge of the Castelnuovo chalks, from which you will be dominating the doline of Cà Pianté. After that, you will re-enter the woodland, reaching briefly the ridge again, to finally descend into the original track that leads either back to the car park or to Cà Carné. This itinerary has a length of about 5 km and can be walked in about 3 h. It is also possible to complement this excursion by entering the ‘bowels’ of the ‘Vena del Gesso’ proper, with an exploration (via guided visit only, every Sunday May to September) of the Grotta della Tanaccia – an experience of the foremost interest even for the non-speleologist. In order to do this, when leaving the Rifugio Cà Carné take the direction towards Brisighella, and soon – after about 1 km; car park on the left – you will find a short deviation with a marked path to the ‘Capanno Speleologico’ (“Speleological Hut”), which is usually the nearest meeting point for the entrance to the cave, whose humid habitat is framed by the elegant leaves of Hart's-tongue Fern (Phyllitis scolopendrium). The descent is exciting, and accompanied by the guides (with the help of torch lights), one will admire the galleries excavated in the chalk by the limpid subterranean stream, while remaining enchanted by the display of stalactites and other rock concretions. This easy speleological excursion lasts about 1 h, after which it is advised to head back to Brisighella for a visit of its Medieval town centre – especially atmospheric by night. The Itinerary of Monte Mauro (No. 2). This itinerary starts from the road that ascends to Monte Mauro (515 m; the most elevated summit of the ‘Vena del Gesso’), a transverse to the right (direction Zattaglia) of the road that goes along the Sintria valley floor. From the lay-by before the last rise to the Pieve of Santa Maria in Tiberiaci, one continues on foot along the CAI-marked path No. 511, which goes beyond the church and rises along the spectacular ridge of Monte Mauro itself, cutting half-way up the mountain. From here one can admire a breathtaking panorama over the whole plains of Romagna – until the sea in the clearest days. One then skirts the summit of Monte Mauro to the south, where it is also possible to admire the best examples of the characteristic vegetation of the chalk banks and the garrigue formations. The path then enters into the woodland, descending rapidly along a forest track until crossing a country lane that one takes to the left towards Cà di Sasso – right under the cliff of Monte Incisa, where we then take the CAI-marked path No. 513. After a little while, one leaves also this country lane behind, to follow another track to the left that dominates a small valley of ‘calanchi’ (erosion phenomena on clay). Past another house, at the next junction one bears left, into a country lane that has to be followed until the next sharp bend, where one takes to the right another track until Cà Castellina. One then continues to ascend – always keeping to the right – as far as under the small pass of Cà Faggia. Past the house bearing the same name, one then descends amidst the woodland until Cà Sasso, where one enters another track to the left that leads to the picturesque hamlet of Borgo dei Crivellari, whose original oldest houses in chalk and flint date as far back as the 13th century. One then rises along a path in the middle of the hamlet, amongst thickets of shrubs and patches of dry meadow, in which it is possible – in spring – to admire the blossoming of many orchid species. One thus reaches the chalk ridge and returns to the path CAI No. 511, on the summit of Monte della Volpe (495 m). We then take to the left, taking extra care in some difficult sections of the trail, with a few exposed passages in the rocks, among the garrigue formation, here composed mostly of Terebinth (or Turpentine) tree (Pistacia terebinthus) and Italian (or Mediterranean) Buckthorn (Rhamnus alaternus), while admiring at the same time the evolution of birds such as Common Kestrel (Falco tinnunculus) and – in the fields, among the chalk boulders fallen from the ridge – the passage of animals like roe-deer, who also come here to graze. The view opens up over the two valleys of Sintria and Senio, and their scenic alternation – like a natural mosaic – of vineyards, orchards and pastures, interspersed with thickets of vegetation and divided by the irregular line of the hedges. After a while, our excursion runs under the chalk cliff, where one can glimpse a sight of the blind valley of the Rio Stella – a small stream that then disappears into the rocks, only to reappear – after a subterranean course of about 1 km – under the name of Rio Basino, which forms a small picturesque gorge. Following on along the ridge that dominates the cliff, we then reach the starting point of the itinerary. This itinerary is about 1 km long; it takes about 6 h to complete, and it allows to discover all the most salient aspects of the 'Vena del Gesso'. The Itinerary of Riva San Biagio (No. 3). This itinerary starts from the main square in Tossignano – an ancient settlement built on chalk, on a hilltop position dominating over the Santerno valley. From here, one takes the CAI-marked trail No. 705 until the church of San Mamante and the ruins of the Medieval castle. We then skirt along the hill over which the old village is built, on a path that then descends to the Tramosasso gorge, which can be crossed at the point where the Sgarba stream disappears under the chalk rocks, to then continue under the imposing cliff of the Riva San Biagio, after which we will walk through meadows, thickets of juniper and broom garrigue and large chalk boulders fallen from the ridge. After the ruins of Cà Nova, one can reach the summit of the ‘chalk vein’ at the pass of Passo della Prè (384 m); from here, we follow the ridge for a long while, always paying attention after heavy rains. The path is flanked by Holm oak thickets interspersed with Italian (or Mediterranean) Buckthorn (Rhamnus alaternus); frequent are also the traces of little tunnels excavated by hedgehogs – a small animal of which sometimes one can also find the long, striped black-and-white quills. We gain thus the top of Monte del Casino (474 m), from which we then descend to the pass of Cà Budrio, passing the house bearing the same name to the south and a doline whose meadow is an ideal site for the observation of various species of orchids in spring. After skirting the doline on its lower edge, one still follows the CAI-marked trail No. 705, which – among a few chalk boulders – begins to rise again over the rocky bank. One then proceeds flanking a nice chestnut grove to the left and, to the right, the typical garrigue of the chalks. We will then get in sight of the church of Sasso Letroso, where we enter a country lane that returns westbound, through some old orchards and the lower part of the chestnut grove. One then goes past the localities of Cà Oliveto and Cà Siepe; here, the views become quite vast, and look over the ‘calanchi’ formations of the Rio Gambellaro. At the junction we bear left, on the track that rises again towards Cà Budrio, where we take the lower trail, which enters into a woodland at times substituted by chestnut groves, until the abandoned remains of Villa Le Banzole; one then descends towards a pool of water where we take the communal road that continues as far as the ruins of Casone Nuovo and re-descends into the narrow Tramosasso gorge, from where we then proceed along the Rio Sgarba towards the Santerno and – just before reaching the river – we rise again to the left among apricot trees, until reaching the cemetery of Borgo Tossignano, from which a series of paths – cutting away the sharp bends of the tarred road – allow us to reach finally the old part of Tossignano, where the itinerary had started. This itinerary, all in all, is about 11 km long, and it takes about 5 h to complete; once returned to Tossignano, it is also possible to make a stop at the Visitor Centre “I Sassi e il Fiume” (‘The Stones and the River’), dedicated to the ecosystems of the ‘Vena del Gesso’ and the Appennine streams that run across it. The Itinerary of Monte Penzola (No. 4). This is an itinerary of relevant geologic interest, which starts just before the bridge on the main road along the Santerno valley, in the vicinity of the famous chalk boulder known as ‘Sasso Sasdello’, precipitated right in the middle of the river. One ascends following the CAI-marked trail No. 703 to the north of the ‘Vena del Gesso’ until the summit of Monte Penzola (409 m), which one can reach with quite a steep rise among apricot orchards and patches of arid meadow. From the top of this small mountain one can admire a vast view over the Santerno valley; lower down – among the chalk boulders that have precipitated on the valley floor and amid the shrub thickets – one can sometimes spot roe-deer and wild boar. Past Cà Budriolo one then ascends to the right – among broom scrub – until the clayey ridges where the section of trail over the ‘calanchi’ of the little Rio Mescola valley starts. One then crosses a ploughed field to ascend – along a narrow path on clay – up until Monte dell’Acqua Salata, which owes its name to a spring of salso-bromoiodic waters, typical of clayey areas. We then descend along the ridge as far as the ruins known as ‘Ruderi della Carrè’, where the path often becomes a muddy track, until past the area occupied by the ex-quarry of Monte del Verro. After the quarry, one takes a trail to the right that first rises, then turns right again until the spring of Rio Mescola and the summit of Monte Maggiore – a clayey hillock reaching 455 m. One then descends to the base of the hills, while the path on the ridge of the ‘calanchi’ becomes even narrower – but also more thrilling – until the so-called ‘Ponti di Croara’, from which we reach the little church of Croara, where we enter the road that, after a short stretch, rejoins a path to the right, which allows us to return over the ‘calanchi’ ridge. From there, we finally gain a monumental pine specimen – the so-called ‘Pino dei Sabbioni’ – then the ruins of Cà Frascari; here we start going downhill again, in the vicinity of the bridge over the Rio Mescola, until – after a short stretch along the ‘Montanara’ (the National road that runs on the Santerno valley floor) – we return to the starting point. In this same location begins another shorter itinerary, which allows the discovery of the hilly section along the Santerno: we first proceed upstream along the right bank of the river, among thickets of poplar and willow and wide gravelly sections of river bed; in the normally tranquil stream one can get a glimpse of fishes such as European Chub (Squalius cephalus) and South European Nase (Chondrostoma genei). Once in correspondence with the Bailey bridge, we cross it over to the left bank and follow the trail that separates a large golene basin of the Santerno, then keep on until crossing via Rineggio, where is located the environmental centre Centro Educazione Ambientale “La Casa del Fiume”, equipped with picnic tables for a quiet stop; from here we return to the starting point, flanking once more the shady banks of the Santerno. The overall length of this itinerary is 17 km, which can be covered in about 6,30 h (but it can also be divided into shorter stretches).